Queen Hatshepsut's flacon : Deadly medication? This allowed Dr. Wiedenfeld and his team to analyze the old substances for their ingredients. And it became obvious very quickly that what they had found was not dried-up perfume. The mix contained large amounts of palm oil and nutmeg apple oil. "I didn't think anybody would put so much grease on her face," said Dr. Wiedenfeld. "That would make her look as greasy as a plate of ribs." Two additional components clued the pharmacologist in to the actual purpose of the mix, "We found a lot of unsaturated fatty acids that provide relief for people with skin diseases." And this is where the Egyptologist was able to add another piece of the puzzle, "It is indeed known that there were cases of skin disease in Hatshepsut's family." Inflammatory skin diseases such as psoriasis have a largely genetic component. 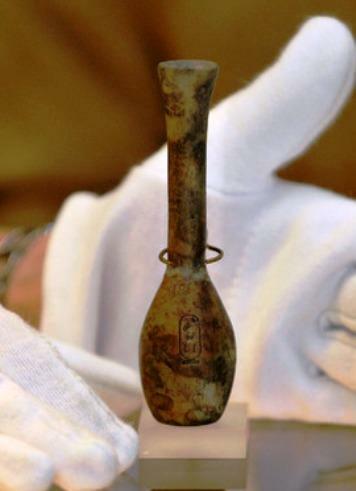 What the pharmacologists detected in Hatshepsut's little bottle was in particular benzo(a)pyrene, a hazardous aromatic hydrocarbon consisting of several carbon rings. "Benzo(a)pyrene is one of the most dangerous carcinogenic substances we know," explained Dr. Wiedenfeld. For example, the risk of contracting lung cancer from cigarette smoke results essentially from this substance. Did the lotion cause the Pharaoh's death from cancer? Did Hatshepsut maybe poison herself without knowing it? "There is a lot that speaks for this hypothesis," Dr. Wiedenfeld said. "If you imagine that the Queen had a chronic skin disease and that she found short-term improvement from the salve, she may have exposed herself to a great risk over the years." The Egyptologist also thinks that this is very likely. "We have known for a long time that Hatshepsut had cancer and maybe even died from it," said Michael Höveler-Müller. "We may now know the actual cause." But at this point, the Bonn scientists can only surmise how Hatshepsut obtained her lotion. "Egyptian physicians were general practitioners and good surgeons, but they were lousy internists," explained Dr. Wiedenfeld. "It is quite possible that they owe their knowledge of certain medications to their contacts with Persia and India where the healing arts were very advanced even in Antiquity."